Since we are going to be snowed in for a few days, this might be a good time to start recapping the holidays, mostly so I don’t forget they happened! After a rocky start to the holiday season, the Tamiflu kicked in, and I think we were able to pull together a pretty decent Xmas, even though we stayed at home in our Influenza-quarantined home. It was a more stripped-down holiday than I would have liked, given that my kids are at the sweet-spot, age-wise, for all things Christmas. I was a little depressed that I wouldn’t be able to pull off my usual gingerbread-y cookie plate, which is one of my favourite traditions, but then it occurred to me that, if all four of us were sick, we could just make cookies for us and not share them. It doesn’t matter how germ-y our hands are, when we all have the same flu, right? And this way, I could practice letting go of my OCD obsession with perfectly decorated Christmas cookies, and just let the kids go to town with my rather impressive collection of sprinkles, sanding sugars, and other cookie decor. And so we did, on Christmas eve, no less. It is a lesson I find I have to learn over and over again as a parent, this letting go of the Platonic ideal of what a thing or an experience should be, and just allowing these moments in life to unfold imperfectly. 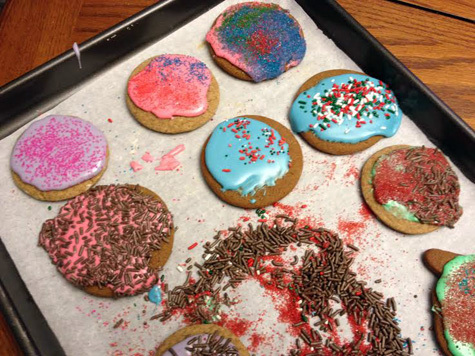 Our cookies were deeply imperfect, but it was great fun to just let the kids sprinkle with abandon, over-ice everything, and make a huge mess. They were so proud of their cookies, several of which ended up being left out for Santa later that evening. It is hard for me to reconcile it: the plate of cookies up top were last year’s holiday offering, and this tray is this year’s batch. 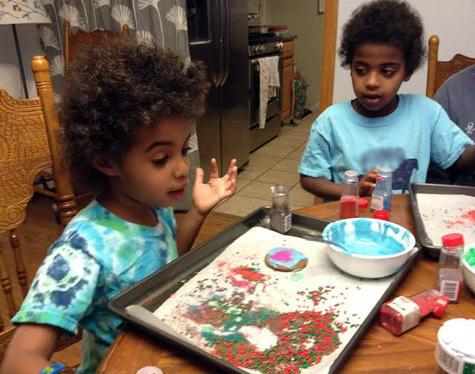 But I wouldn’t trade the look of pride on their faces as they finished each cookie, after carefully contemplating the perfect icing colour/sprinkle combination. And that was Christmas Eve: baking, decorating, and last minute cleaning. The kids ran to bed, eager to fall asleep fast so that Santa could come, and bed time was a breeze. Later, the mister and I eschewed these gingerbread in favour of some simpler versions, chocolate dipped without sprinkles or doodads, and we wrapped and wrapped and wrapped and wrapped, and fell into bed at 1AM, like parents everywhere, dosed up to the gills on flu medication and ready for Santa. Tomorrow is the last day of school before the winter break, and the last day of dance class. So today and tonight, I am in a flurry of baking, getting holiday presents, cards, and cookies together for the people who care for my girls when I am sitting at home drinking diet Coke and playing Civ V for hours at a time. I mean, when I am writing my dissertation. ahem. This year, everyone gets Gingerbread. It is my thing. Here is my recipe: it can be your thing, too. 1. In a large bowl, sift together flour, baking soda, and spices. Adding a little extra flour makes these cookies very soft. Set this bowl aside. 2 According to the official recipe, in electric mixer fitted with the paddle attachment, cream the butter – I do my mixing by hand, because I am a martyr. Add sugar and beat until fluffy. 3. Mix in eggs and molasses. 5.Divide dough in thirds; shape the thirds into flat bricks and wrap each third in plastic. When you are done, your fridge will look like it is filled with bricks of heroin. Feel badass. 6. Chill for at least 1 hour-2 hours. Before rolling out, let sit at room temperature for a few minutes. If after refrigerating the dough feels too soft to roll-out, work in a little more flour. 7. If you like a little flavour in your gingerbread, try rubbing your cutting board or rolling pins or hands with a very, very small bit of flavouring – chocolate liquers are nice, as are cointreau or straight orange flavouring. Blood orange would be nice, too, especially on the ones dipped in chocolate. 8 Heat oven to 350°. I have a large wooden board that I use to roll my cookies out on, which I cover with flour – a cutting board would work well too. Using a rolling pin, roll dough – not too thin – I usually do mine about half a centimetre or more. Use a cookie cutter to cut into desired shapes. 9. Transfer to baking sheets – I line mine with parchment paper and bake the cookies on that, to keep the bottoms from hardening and going dark. Bake about 6-8 minutes, until cookies are still soft. Remove from oven and let the cookies sit on the cookie sheet on top of the oven for a few minutes more to set. Move to a wire rack to cool completely. I like my gingerbread soft. How do you make cookies soft? Easy: cut them thick, underbake slightly, and let them finish baking on top of the stove while they set on the cookie sheet. if you like them crispier, bake 8-10 minutes, until the edges start to brown. 1. with a hand mixer, combine confectioners’ sugar and meringue powder. Mixing on low speed, add a scant 1/2 cup water drop by drop. For a thinner consistency, usually used for flooding, add more water. A thicker consistency is generally used for further embellishing. Mix until icing holds a ribbon-like trail on the surface for five seconds when you raise the paddle. ** some people make icing with egg whites, but there are a lot of people (the pregnant, immune-compromised, etc) who cannot eat raw eggs, so in the interest of not asking random acquaintances about the current contents of their uterus, I opt for meringue powder. 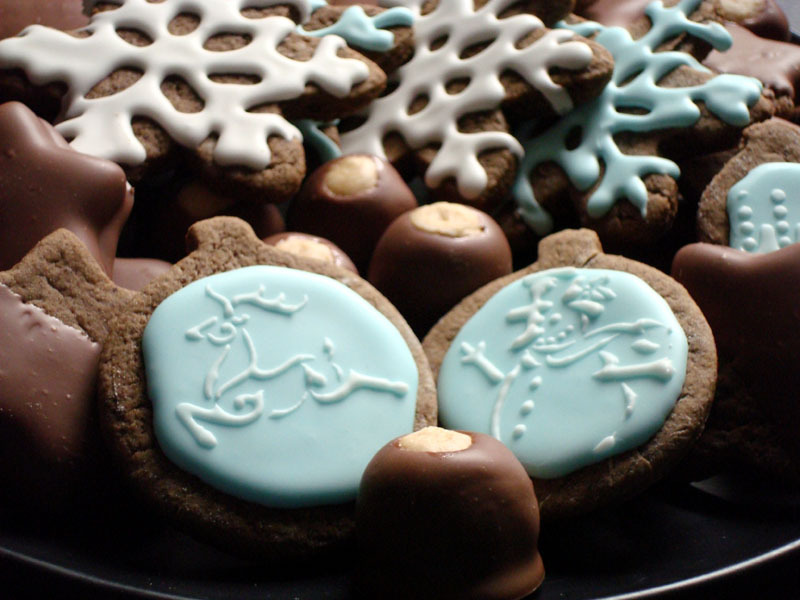 I am old-fashioned – I pipe my royal icing on using an icing bag. Decorate as you see fit – sprinkles, etc. I usually do one round of icing in one colour, to cover the cookie, then after that hardens, take while icing and pipe pretty patterns on top. So cute. That is how the reindeer and snowman, above, were done. I cut some of my cookies using holly leaf and Star of David cookie cutters, and dip half into chocolate. It is heaven. Recipe: Melt chocolate – use the almond bark baking chocolate for super easiness. Dip cookies. Let them set for a few hours on parchment paper. Eat. This one is pretty easy. I can’t say I am the most involved parent in my kids’ classroom. I am not a room mom, and our school doesn’t have parent volunteers come in during the week to read or do crafts, but when we get requests for help for the holiday parties, we always say yes. For Hallowe’en, I sent in healthy snacks – little mandarin orange fruit cups with jack-o-lantern faces markered on them (Thank you, Pinterest! 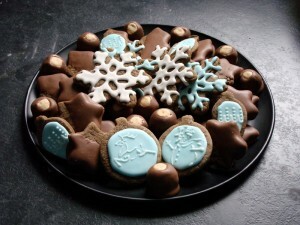 ), and when I got the volunteer form for the classroom Xmas party, sent the form back saying I would make gingerbread. Gingerbread is my thing. Everyone has a talent or two in life, and mine is baking, and specifically, mine is gingerbread. It is good. That is a picture of a quick tray I made, above, and later this week, I will post the recipe and how-to, if you would like to make it yourself. I do fancy icing, with lovely snowmen and reindeer, and tone-on-tone layers, and some of it I dip in chocolate, and it is heaven. People ask me to do it professionally all the time (no! 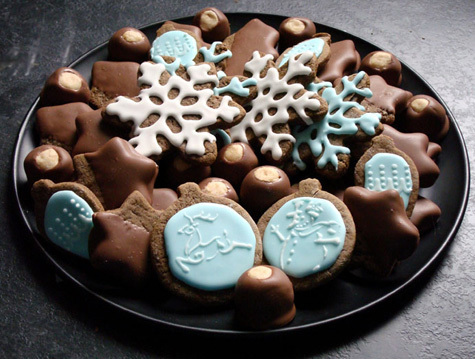 ), and once, I did a tray for a party and a guest stole half the cookies – just unloaded them into a ziploc in her purse – because “they were so pretty”. So, I have this talent, and I can only share it for about one month a year, and even though it is crazy labour-intensive, I am happy to do it for the school. So, cut to last night, when the official ‘room mom’ called me. The school really wants healthy snacks for the party, she says. Like, maybe one sweet, but the other stuff should all be healthy. And then there is this deadly silence.Since I know this is her first year at the school, and since this is my second year in this classroom with this teacher, I tell her that, although yes,they do ask that, typically, the holiday party is a little over the top, and whoever does the food table at the kids’ party limits them a bit, and then all the rest goes to the Faculty Lounge as God intended, for the teachers to enjoy at their leisure after the kids leave for the day. This is also met with a weird pause, and since I am a real grown-up, and I certainly am not going to pick this particular hill to die on, I fill the odd conversational void to say that I am happy to bring something else – whatever she thinks best. What do you need to round out the snacks, I ask? I am happy to provide whatever you want. Just tell me. And then it starts. Oh, no, she says. You can bring gingerbread. I was just calling to check. And I want to ask, check what, exactly? But I do not, because I (usually!) know the difference between the conversations you wish you could have, and the conversations you can actually have. But now I am confused. If she isn’t asking me to change what I am bringing, and if I offered to change it in case she is too polite to just come right out and say it, then … what is the point of this phone call? I felt like maybe there was some sort of subtext that I was missing, some kind of secret mom code that I lost the manual for. If I said I was bringing gingerbread, and she agreed that was okay, then why call at all? So, I am making gingerbread. And I might be in trouble for making it, but also, nobody is asking me not to, and when I volunteered not to, I was told it was okay to make it. My kids are in Preschool, so I don’t have years of PTA political experience to draw from. And I am not from the south, where everyone innately knows that every social interaction is steeped in unspoken social code. Can anyone translate what just happened to me, here? Its the girls first Christmas as part of a family. I hope we don’t screw it up! Packing tins of cookies to deliver to friends. When you make as much gingerbread as we do, you get a little warped. Its the annual massacre in Snowman Village! We got our cards out very late, but we did get them out. Sure it was just days before Christmas, but it still counts! G made sure Jack felt loved by kissing her and kissing her. Its a love-fest. No way we are going to toddler-proof a real tree, so we got a metal one and put it on the dining room table, and just used ornaments that have special meaning to us. That ornament of the girls up top was our 2008 ornament ( we get one ‘year’ ornament every holiday ). We were legally parents, but forced to spend our first Christmas as a family, and our daughters’ first Christmas, ever, 8000 miles apart from our children. It was a hard holiday. This year’s ornament is square silver locket to the right, and engraved on the front is “Finally, a family. January 12, 2009″. Its a much, much better Christmas this year than last. And yes, that is pink Christmas paper. After a decade of very serious Christmas decorating and very serious Christmas trees, we went a little goofy this year. Who loves Santa? Everybody! Err…. nobody. Tomorrow is our kids’ second Christmas, but their first Christmas as part of a family. Tomorrow is our second Christmas as parents, but the first Christmas we get to spend with our children. Tomorrow we will be hugging them close and giving thanks. Merry Christmas to you all.